0 LATHE T.C. – Designates control as a lathe. 9 SPIGOT KEY INVERT . 12 REVERSED CONVEYOR – Reverses the direction of the chip conveyor. 13 M27-M28 CONVEYOR – Usually the chip conveyor motor and direction relays are attached to the user relays M21 M22. When this bit is set, the control expects to see the conveyor hooked up to M27 and M28. 15 GREEN BEACON – When (1) user relay M25 is used to flash a beacon. If the control is in a reset state, the beacon will be off. If the control is running normally, the beacon will be steadily on. If the control is in a M00, M01, M02, M30 feedhold, or single block state, then the beacon will flash. 18 DISABLED COOLANT IN . 19 T.C. FWD CW – Determines the direction that the turret moves as viewed from the spindle, when the turret is commanded forward. When (1), the turret will rotate clockwise for a forward command, and when (0), it will rotate counterclockwise. The default is 1. 20 REMOTE TOOL RELEASE – Supports the VTC-48. It specifies that the machine has a remote tool release button. It should be set to 1 on the VTC-48 and zero on all other lathes. 21 FLOPPY ENABLE – Enables an installed floppy disk drive. 24 hpC ENABLE – When set to zero, the machine will behave normally. When set to 1, the High Pressure Coolant pump can be turned on with M88 (this will first turn off the regular coolant if it was on, just like an M9). High Pressure Coolant can be turned off with M89. Note also that if a tool change is commanded when the hpC pump is running, it will be turned off, followed by a pause of the length specified by Parameter 237. hpC must then be turned back on by the user’s program. 25 AUX JOG NACC – Does not allow accumulation on auxiliary axis jog. If the jog handle is moved rapidly the auxiliary axis will not develop extremely large lags. 27 RAPID EXSTOP – Default is 1. When this bit is set to 1, the control will execute an exact stop after all rapid motions, regardless of the next motion. When set to zero, the control will exact stop after a rapid only if the next motion is not a rapid move. 29 HYDRAULICS – Must be set to 1 if a lathe has the hydraulic chuck clamping option. 30 STALL DETECT – Enables detection of spindle stall. If spindle stalls, the spindle motor is stopped and an alarm is generated. 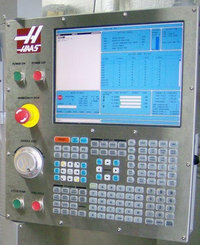 31 SPINDLE NOWAIT – When (1), the machine will not wait for the spindle to come up to speed immediately after an M03 or M04 command. Instead, it will check and/or wait for the spindle to come up to speed immediately before the next interpolated motion is initiated. This bit does not affect rigid tapping.